Finland is covered in snow! Winter has finally come. When it’s cold outside, people gather inside to spend time together with family and friends. The Finnish people start celebrating Christmas as early as in November with these gatherings they call little Christmas or “pikkujoulu” in Finnish. 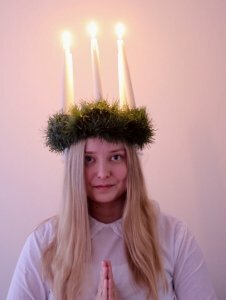 I tell a lot more about the Finnish Christmas traditions, the old and the new, in the book Norded – The Ed Nord story, but since the 13th of December is so near, I want to mention a day that is known as a Lucia Day here in Finland. Each year a fair, usually blonde maiden is dressed up as Lucia-maid of the year. White gown, red belt and crown made of candles, are the important features. The celebration of Lucia Day is more common among the Swedish speaking communities in Finland. This country is officially bilingual: Finnish and Swedish are the official languages. Up north in Lapland there is a third minority language called the Sami. Swedish as an official language is a remnant of Finland being part of the kingdom of Sweden until 1809. No one was really able to explain me why the second official language is Swedish and not Russian, since Finland was a part of Russia from 1809 to 1917 when Finland became independent. Being bilingual opens doors to Finland in the west. At the same it’s opening doors for Norded. We are very interested in finding products and designs from all over Scandinavia. 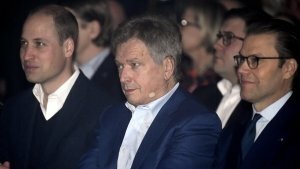 At Slush 2017 we had an amazing opportunity to meet a Swedish prince, Daniel (on right in photo). Such possibility doesn’t present itself just every day. Norded also has the language skills to communicate with Scandinavian people where Swedish in a way is the lingua franca. Norwegian, Danish and Swedish speaking people usually understand each other. Luckily with our skilled staff, Norded can communicate with them all. Don’t forget to listen to the Norded interview from Slush 17! Norded thanks Fredrica Nyman for her excellent performance as Lucia.